Comparing BerryBurst MAX with the normal version can be difficult in regard to graphics. These games are exact copies, except the Volatility. All symbols are beautifully created Berries and fruits. The lower paying symbols are gemmed card faces like Clubs, Hearts etc.. The funky background music is sure to bring you to some beach bar close to the equator somewhere. We find the same features in BerryBurst MAX as in the normal version, with the important difference that the symbols pay out more. We find the re-spin granting stacked wilds, and cluster pays. Beyond that, there’s not a lot of features to talk about. 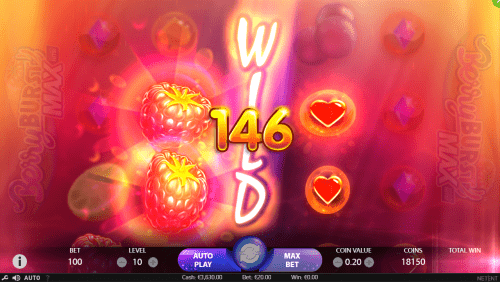 The expanding Wilds in BerryBurst MAX can land on any reel, and grants a respin for each new wild that lands. Here the ultimate goal is to fill the reels with wilds, granting the highest payout of 10000 coins. So what is the difference between BerryBurst and the MAX version? We’ve noticed a few things that boost the volatility in the MAX version. Second, Looking at the paytable, we can clearly see a higher payout in both low and high paying symbols as well.The below images indicated pay-outs at level one. 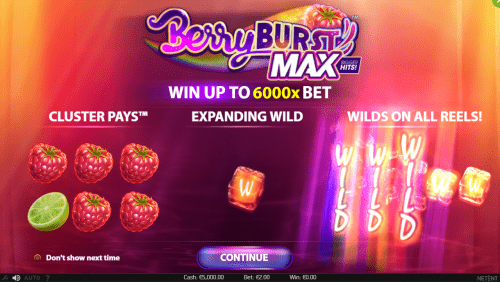 As you can see, BerryBurst has a slightly lower return to player, however looking at the paytables, you will see the potential for big wins is much higher. BerryBurst MAX is by all means not a revolutionary slot on its own. That said, we think it’s a great way for Netent to present the new MAX mechanics in a setting where it’s very clear to find the the additional volatility and boosted symbol wins. Now all we have to do is sit back and relax while we wait for new, a bit more extensive slots popping up with a casual and max version.